Well, this was way too close. 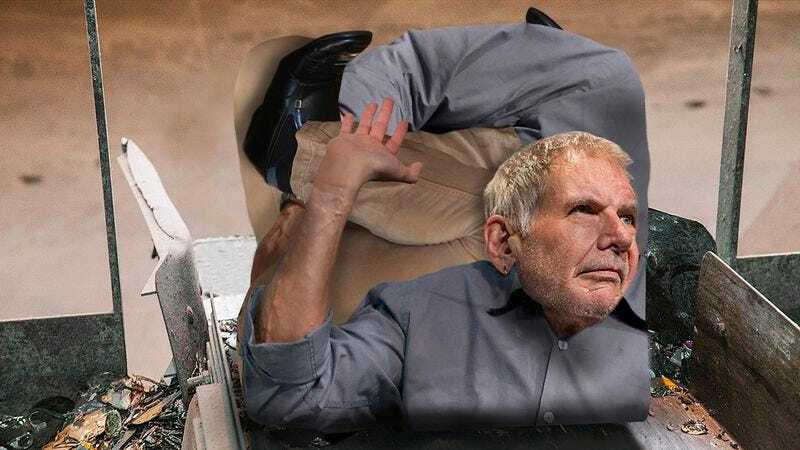 Representatives of Harrison Ford confirmed that the actor is recovering today after being compacted into a cube on a conveyor belt. Early reports say the 73-year-old Blade Runner star was almost entirely crushed along with a pallet’s worth of factory waste after slipping and falling onto the conveyor belt system. From what we know right now, Ford entered the office supply manufacturing facility early yesterday afternoon after having smelled what he thought was pie. He was then caught by a loose swinging winch crane and thrown onto the conveyer belt. Ford ducked a number of large spike rollers and several rapidly rotating gears before jumping clear of two industrial blowtorches by grabbing hold of a hanging catwalk platform. Then, having narrowly avoided the belt’s conveyor cleaver chopping mechanism, Ford was reportedly thrown with flailing limbs into the facility’s baler, where he was smashed flat twice like a pancake, at various points rolled into a tight ball, and finally smushed into a cube. The Star Wars A-lister was saved thanks only to a watchful foreman, who noticed Ford’s scared, blinking eyes squished together into a cube with the factory refuse. An ad hoc rescue team of workers was able to save Ford before he reached a white-hot incinerator, forklifting the actor down to the factory floor. Ford’s family maintains that the star continues to keep his chin up. A tweet this morning from Ford’s son seems to confirm that the actor made it through his terrifying ordeal and will soon be back in fighting shape. Hope you feel better soon, Harrison! We’re pulling for you.